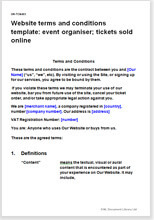 This is website terms and conditions document is for a website marketing an event and selling tickets off the website. One is for the owner or organiser of the event (this document). The other is for a business selling tickets for many events managed by others. That is at TandC ticketing agency. If you manage ticketing for other people, and multiple events, use the document we mentioned above at TandC ticketing agency. "I having spent hundreds of thousands of dollars on lawyer over my lifetime in business, how I wish I had found you sooner"